Problems of adherence to complex medical regimen are spread among individuals with chronic diseases like diabetes, hypertension, and HIV. And because the risk of more health problems can be reduced by good adherence habits, patient’s non-adherence to treatment prescriptions is quintessential for health care professionals. That’s why adherence became an issue of intensive research by many different teams since the 70s. For instance, studies showed that about 50% of patients diagnosed with hypertension were not taking the correct doses of their meds, and that non-adherence was common, especially with long-term treatments for conditions such as diabetes, asthma, hypertension, and HIV. Forgetting to take drugs is also related to certain reasons like using more than one pharmacy, going to different physicians, confusion about the medical regimen, or incorrectly labeled meds containers. Thus, care providers must do extra efforts during the patient visit to deal with the possible problems related to non-adherence. Adherence to complex medical regimen needs a behavioral strategy covering aspects like complete awareness of the regimen, belief in the total benefits of the treatment course, and building an interpersonal relationship between the caregiver and the patient along with the social support from family members and friends. In order to increase the benefits of the medical treatment, both the therapist and the patient need to really work together. 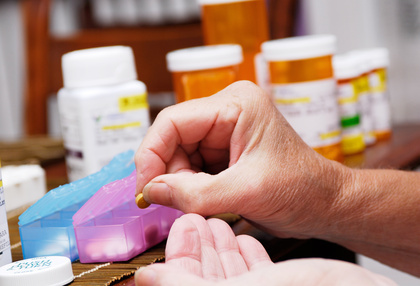 They can enhance adherence by clearly explaining the regimen to their patients, recognizing their behavioral patterns, instructing them to effectively use different medication reminders and encouraging family members to be more supportive. The good news is, there exist may tools to help remember the medication. Pill-boxes: A simple box with slots for different medications and could be found at any store and it’s relatively cheap. However, studies show that mixing medications in a single container can rub together and decompose and that could make them less effective. Alarm Devices: Medical watches and alarm devices can be another solution. They can be programmed with some specific medication information, dose and schedule. Yet patients, who may have difficulty seeing smaller print, may have difficulty with this type of reminder. In addition, the elderly are sometimes bothered or confused by electronic beeps. Pill Dispensers: Pill dispensers are much similar to pill boxes, except they have features that allow for easy or even electronic and automatic dispensing. Dispensers are the most expensive option on the market, though, and may not easily fit into every budget. And you need to configure it in advance. Mobile Apps: The newest generation of medication reminders, mobile apps, deliver almost all features most patients could ask for and can fit in your pocket where ever you go. Take our Medica app as a good example. With Medica, you can fill in your prescription with medication times. You can even capture a photo of your medication or record your doctor’s instructions in voice. When it’s time to take your dose, it pops up with gentle alarm to remind you of your medication. Thanks to apps like Medica, now patients can easily mange their own medication reminders by themselves without any need for external help.